Only a few days have gone by since we have passed the finish line of ECSS MetropolisRuhr 2017. We would like to express our gratitude to delegates from 84 countries who made their way to Essen. It had been our challenge to include all our energy and passion in preparing and realizing a great conference with high quality scientific sessions and inspiring social events. We want to thank all ECSS boards for trusting in our scientific excellence and believing in our enthusiasm and power. Organizing a big congress like MetropolisRuhr 2017 cannot work without teamwork. A congress like this could never have taken place without the support of so many dedicated and enthusiastic people. 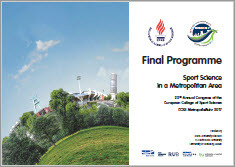 We would therefore like to thank all the people who contributed to the success of the 22nd ECSS congress. This congress was one further step in reaching our common vision of sport science to have continuous huge impact on a broad range of fields and disciplines and on our entire society. Sport science helps to optimize children´s early development in Kindergarten and school, helps coaches and athletes in elite sports on their way to healthy performance, explains more and more of all basic principles of exercise, health and performance, and further, transfers knowledge to the main key players and convinces employers and politicians that physical activity and exercise is the best medicine. Last but not least, sport science provides an appropriate occupational field for our graduates and young researchers. We – sport scientists from all over the world – are only a small subgroup within our big society of more than 7 billion human beings. We will keep on networking and collaborating in a respectful, tolerant and fruitful interaction. We will continue to establish friendships, analyze basic molecular or sociocultural interrelations in connection with sports, physical activity, performance and health and develop principles of knowledge transfer. For doing so, using platforms like the ECSS congresses is a great chance to further deepen and strengthen our common power to make our world a little better.